There are a lot of people who understand the Identity issue, and are not Christians. People are not being told how to become a Christian. Many ministries are addressing the identity issue, but those ministries, for the most part, are not telling people how to become a Christian. In Churches today, most people are not Christians—they have not been born of the water and the spirit. They must do what the Bible tells them to do and not what their preachers tell them to do. And, if you listen to the preachers of the land today, be it a Billy Graham Crusade, or the promise keepers that are now becoming so prominent, or the average Podunk Hollar Judeo-Christian that gives an invitation at the end of the service—they are all being told to accept Jesus Christ as their personal savior and let him come into their heart. But, the Bible does not tell us that. No one in the Bible was ever told to let Jesus Christ come into their heart. 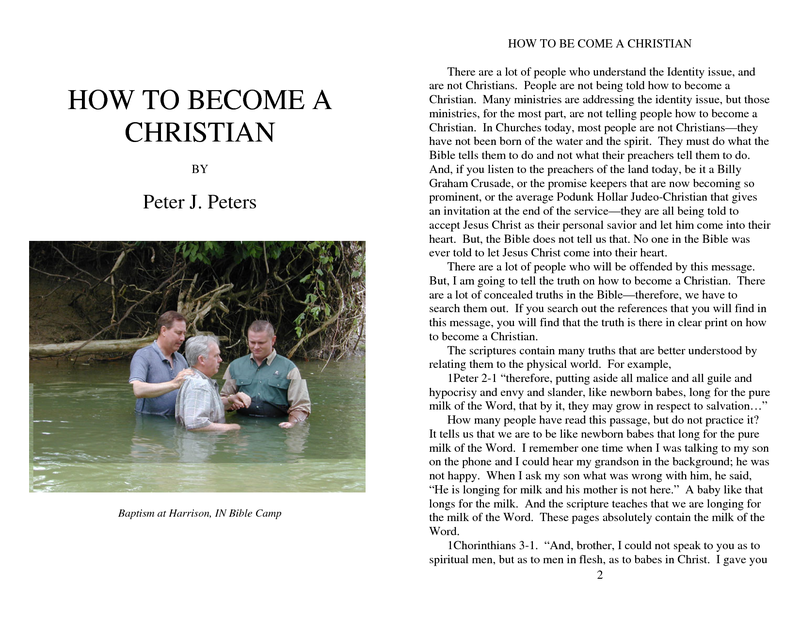 this message, you will find that the truth is there in clear print on how to become a Christian. How many people have read this passage, but do not practice it? It tells us that we are to be like newborn babes that long for the pure milk of the Word. I remember one time when I was talking to my son on the phone and I could hear my grandson in the background; he was not happy. When I ask my son what was wrong with him, he said, “He is longing for milk and his mother is not here.” A baby like that longs for the milk. And the scripture teaches that we are longing for the milk of the Word. These pages absolutely contain the milk of the Word. 1Chorinthians 3-1. “And, brother, I could not speak to you as to spiritual men, but as to men in flesh, as to babes in Christ. I gave you milk to drink, not solid food, for you were not able to receive it. Indeed, even now, you are not yet able; for you are still fleshly.” This teaches that many people are just fleshly (non-spiritual men and women) who want the meat, when they really need is the milk. What they need is to be born and to become babes in Christ. What are you going to do when you get out of school? What are you going to do when you get out of college? What are you going to do when you get out of the service? What are you going to do when the kids are grown? There is another question that you need to be asking—what are you going to do when you die? Particularly, if you haven’t properly addressed this question of how to become a Christian. I am finding out that this thing called life goes by rather quickly and you will be asking yourself that question before you know it, if you are not already doing so. What are you going to do when you die? You need to know how to become a Christian. There is a passage in Matthew 7 that people should read. Especially, people that have believed the lie “Accept Jesus Christ as your personal savior.” I know that you have heard people say, “I became a Christian on such and such a day, I remember it well; I began to pray and I was born again.” Or, “I was sitting on the front porch and I accepted Jesus Christ as my personal savior and I became a Christian.” Well, no, they did not and neither will you in that way. NO ONE, NO ONE becomes a Christian except by God’s way. Now, if that does not make you feel good, go find a church that makes you feel good. My job is not to make you feel good. My job is to tell you the truth, and the truth is, no one becomes a Christian by accepting Christ as their personal savior. If you accepted Christ as your personal savior, good for you! But, now, why don’t you do what the Bible says? The Bible tells us that there would be a people that would be totally deluded on this point. In Matthew 7, Christ had just finished talking about the false prophets. Matthew 7-15. “Beware of the false prophet, who comes to you in sheep’s clothing, but inwardly, are ravenous wolves. is the Will of the Father. Let’s analyze that. First of all, in Verse 22, many people on that day believed in Jesus. It is most obvious that they believed because they call him Lord. Did these people in Verse 22 do many works in His name? Did they prophesize in His name? Did they cast out demons? Did they perform many miracles? The answer is yes. Yes. Now, in Verse 23—read it for yourself—“Depart from me you who practice lawlessness.” Were they saved? No, because they did not follow the Will or the law of God. They did not become a Christian God’s way. They obviously thought they were Christians; they pointed out their works—and, they did works. They did perform miracles. They did cast out demons. How? There were tapping into a law of God that says, “Faith moves mountains.” But, they were not saved. It is clear that these people believed. But, faith is not enough. Why were they surprised? Because they had been listening to false prophets. They were not Christians because they believed the lie that all they had to do was to accept Jesus Christ as their personal savior. “Come forward, if you will. Let us pray together. Come to the altar. Sign this little card. Pray with us. Actually, there is a variety of means, but it all comes back to the doctrine that says faith only. Faith is enough. The previously mentioned people had faith; they had great faith. They had enough faith to do great things—but, they were not saved! They had listened to false prophets. Go to Acts17. Underline Verse 11, and then do it yourself. There we see that it is a noble thing in the eyes of God to examine the scriptures in seeking the truth. If I were to tell you, in answer to the question “How to Become a Christian”, to accept Jesus Christ as your personal savior, then you should examine the scriptures to see if this is right. You should examine the scriptures to see if there was one solitary soul in the entire New Testament that was ever told to accept Jesus Christ as their personal savior. Now, this fact alone should impress you. Here is the biggest lie in Christendom today, besides Jews and God’s chosen people, that’s not in the Bible. John 3-16. If there is ever a scripture that has been memorized, it is this one. This is the verse that is most normally used to promote the “faith only” doctrine. So, all you have to do is believe. NO! You just read a scripture where people believed that Jesus was Lord and yet they were not saved. There is another passage in this area of belief that is also used to promote this faith only doctrine. This verse is so clear. If you believe that God raised Him from the dead, you will be saved. If you just take John 3-16 and Romans 10-8, then I can understand why you might think all you have to do to become a Christian is to believe in Jesus. But, there are many other scriptures that pertain to this thing called salvation. Belief is not enough. The reason it is not enough is because all people have a problem. This problem is—regardless of your net worth or your lineage or your age or where you come from—we are all sinners. We have all sinned. John 3-4 says that sin is a transgression against God’s law. One time, when I was in a motel lobby, I saw Dr. Kevorikian on TV (he is the doctor that assists people in committing suicide). He was saying, “What I do might be against what you believe. You might believe what I do is a sin. But, it is not a crime. Man, for a doctor this man was not very smart!! It might be a sin, but not a crime? Sin is a crime. The definition of a crime is, “a violation of the law.” The definition of sin is, “a violation of the law.” Therefore, a crime is a sin and a sin is a crime. Every one of us is a criminal in the eyes of God. So much so that Romans 6-23 says that we are worthy of death as sinners or criminals. You might not consider yourself a criminal. You might say, as most criminals that go to jail, “I am innocent.” But, you must understand that it makes no difference how you perceive yourself when you stand before the judge; what makes a difference is whether or not the judge perceives you as guilty. And, there will be a day of reckoning—a day when you will have judgment. It will make no difference then how much you believe or how you have professed Christ as your savior; if you stand before the judge full of sin, you will hear the gavel come down and you will hear the pronouncement of “guilty”. For, “the wages of sin is death.” Period. So, if we stand before the judge as believers; as people who have professed Christ; as people who have done great works, but we still have sin to account for, then we will be pronounced guilty. Just like the people in Matthew 7. What I am trying to encourage you to believe is that you are a sinner. Even if you have convinced yourself that you are no longer the criminal worthy of the judgment of death because you have believed or accepted, then you should read in Hebrews 9 about sin. It is important that you understand that just believing in Christ only makes you a believing sinner. Or professing Christ just makes you a professing sinner. There is only one thing that will take care of sin. Notice, it is the blood of Christ that cleanses. the Son of God; that he came in the flesh and died for your sins. Jesus was saying that unless you believe that He is God manifest in the flesh that you will die in your sins. There once was a preacher, an Identity preacher, even, who preached that Jesus was not God in the flesh. And some people fell for his lies. The reason that I angered so many people years ago when I pointed out his error was that he was a friend to so many. But I don’t care if I made him mad. If your friend is teaching that Jesus is just another God then that person is a false teacher. Christ said that unless you believe that I Am you will die in your sins. John 1 then goes on to say that the Word became flesh, and, unless you believe that, you will never become a Christian. It is absolutely essential that you believe this. But, believing is not enough. That is what this message is all about. As a believer, you still have your sin and the only thing that will wash away your sin is the blood of Christ. There is not a preacher in the land that cannot under-stand this passage. But, we cannot see how that blood is applied to our lives. I can hold up a bar of soap and tell you if you want your hands clean, you will have to believe on the soap. How absurd!! You have to apply the soap in order to get your hands clean. And so it is with the blood. You have to apply the blood to your own lives. How? How the Bible tells you to. In Acts, Chapter 2, after the death, burial, and resurrection of Christ, Christ has told the apostles to go to Jerusalem and wait there until what has been promised to them has come and the baptism of the Holy Spirit has occurred. Peter is preaching on the day of Pentecost—that is, 50 days after the crucifixion. preacher telling you to accept Jesus Christ as your personal savior? Peter did not say, come forward and accept Jesus as your personal savior. Nor did he say to believe. Why didn’t Peter say anything about believing? The answer is simple—it would have been redundant. They were already in the believing state. Many people that I minister to are in the believing state. They believe in Christ—that he is the great I Am that came in the flesh. But, now, according to Verse 38, what is the first thing that a believer is supposed to do? Repent. cool! God is not cool!! And, he doesn’t want us to be cool, either. He wants us to be either hot or cold, but not cool, not lukewarm. He will puke us out of his mouth if we are cool. Because that is what is being proclaimed from many pulpits—puke! We might call them pukeky pulpits!! They are telling people that God is cool and you, too, can be cool. I’m ok and you’re ok. YOU ARE NOT OK!! And, you never will be ok until you become a Christian the way the Bible instructs. To be a Christian, you must, number one, believe. And, be willing to believe that He is the Great I Am and to confess him as Lord of your life. And, number two, repent or surrender. It is called in the Bible dying to your old way of life. The old man, the sinful man must die. What else did Peter tell them to do? He said, “Repent and let each of you be baptized in the name of Jesus Christ. How many hopes are there? ONE. instead, because the church of the day was sprinkling. So they took the Greek letter beta and substituted the English letter B and took the Greek letter alpha and substituted the English letter A and they went from the Greek baptismal to baptize. In the Greek the word baptize means immerse. The word is an onomatopoeia; that is a word that sounds exactly like what it is. For example, when we say the dog barks, that is exactly what a dog sounds like—bark, bark. When the dipper would hit the water, when it would immerse into the water, it made a noise “bap”—that is where baptismal came from. So, immersion is what that Greek word means. We can also prove this from the Word of God. Romans 6-3,4. “Or do you not know that all of us who have been baptized into Christ Jesus have been baptized into His death? Therefore, we have been buried with Him through baptism into death, in order that as Christ was raised from the dead through the glory of the Father, so we too might walk in the newness of life.” Chapter 4 talks about baptism as being buried with Christ in baptism. When you take a dead body, what do you do with it? You bury it. You do not sprinkle a little bit of dirt on it—you bury it! You put it completely under. with what they already believe—their actions follow their beliefs. They do not have their heart right with God so that they can see that the Word means just what it says. Baptism is for the remission of sins. If you want to become a Christian, believe that Jesus Christ is the Son of God—the great I Am that came to us in the flesh and died for our sins. You must believe to the point that you are willing to confess with your mouth that He is Lord. And, then do what Peter tells us to do in Acts 2-38, “repent.” That is the surrendering of your life when you say, “Lord, not my will by Thy will be done.” Not what I believe, or what I want to believe, or what they told me to believe, but what Your Word says. Surrender your life. Repentance is analogous to dying to the old way of life—getting rid of the old man. What do you do with dead people? You bury them. Jesus, in the plan of salvation, had to die for our sins. He had to die a bloody death because blood cleanses sin. He was buried in the tomb and on the third day, he resurrected. If you want to become a Christian, this is what you do. As a believer who is repentant, you must die to your old way of life. And then you are buried, as Romans 6-4 says, “we are buried with Christ through baptism.” You are buried in the watery grave of baptism and you are raised up, as the Bible says, to walk in the newness of life. It is so clear when you study it. It is these false teachers that have muddied the waters. Why is it a new life? It is a new life because your sins have been washed away. So, the Bible teaches that baptism washed away sins. How? Because that is where you come in contact with the blood of Christ. It is just like washing your hands when they are dirty; blood was shed for the remission of sins; baptism is for the remission of sins—that is where the soap is applied to the dirty hands, so to speak. Baptism is where the blood comes into contact with your life. Check for your self. Some might question, “So, you are trying to tell me that baptism saves us?” No, I am not trying to tell you that, the Bible tells you that. That is very plain. Baptism saves you. Remember Acts 2-38? “Repent and let each one of you be baptized in the name of Jesus Christ for the forgiveness of your sins and ye shall receive the gift of the Holy Spirit.” This is a very important point. God give us, when we repent, and are baptized, the gift of the Holy Spirit. Repentance is saying, “Lord I will try to stop doing what you don’t want me to do and I will try to do what it is that you want me to do.” Notice the word, try. We try because Christian people do not lead perfect lives. We still have battles. But, the difference is that when we are willing to do it His way, He gives us help. The Bible tells us that the Holy Spirit is our helper and that He guides us in all truths. I will share a personal illustration. When I was studying the Bible—I believed and I thought that I was a Christian. I had a particular sin problem. I chewed tobacco—it got so that one can of Skol a day was not enough. One time, about 7 at night, I took the can of Skol and threw it in the trash. About 11 that night, I was digging in that same trash can to retrieve that Skol. And, I said, “God, if chewing this tobacco means that I will go to Hell, then I will just have to go to Hell, because I can’t give it up.” But, when I was baptized for the remission of my sins, I took that Skol can out of my pocket and placed it on a shelf. God gave me the strength, the help that I needed to overcome this habit. One of the reasons that it is so hard to get truth into the churches today is because they are not Christians. If they were Christians, if they had repented and been baptized for the remission of their sins, then the Holy Spirit would guide them into all truths. I have observed, as I minister across the land, that those people that have not been baptized for the remission of their sins cannot not wholly grasp the spiritual truths as well as those who have been—they don’t have the gift of the Holy Spirit to guide them in the truth. Ephesians teaches us also that baptism seals us in the holy spirit. A king had a seal that no one else had and when he put his seal on something that seal meant that it was his. Much the same is a brand. How do I know which cows in the pasture are mine? Why, the ones with my brand on them. Now, if we have that seal of the Holy Spirit and people start messing with us, then they have Him to contend with because we are His herd. Some of the questions you might have are, “what about a child.” First of all, does a child have sin? Well, if you are a Catholic, yes, a baby is born of original sin. But, Christ took a child and placed it on his lap and said, “Let the little children come to me, and do not hinder them, for the kingdom of heaven belongs to such as these.” Can a baby repent of its sins? No. Is there any place in the Bible where a baby is baptized? No. What about the thief on the cross? That is a different story. He died before Christ and while He was alive, salvation was His to give. Christ gave the thief salvation before He died because it was His to give. But, after His death, while you are living on this side of the cross, you must follow his Last Will and Testament if you want the inheritance. That Will is that you be baptized for the remission of your sins. What about being rebaptized? Well, yes, according to Acts 19— “people were rebaptized for the proper reasons. For example, if you were baptized to join a church or to obtain the outward sign of an inward grace, what you need to do is have the one baptism of Ephesians 4-5 and Acts 2-38—baptism for the remission of sins. 1John 4,4 says, “that he who is born of God overcomes the world (that world meaning “world order”). Now, if you were part of the world order and you knew that people born of God would overcome you or conquer you, then what you would do is to try to keep them from being born again—born of God. If you want to be born of God, then believe that Jesus Christ is the son of God, be willing to confess Him as Lord, humbly repent of your sins, and be baptized (immersed) for the forgiveness of your sins. Then you shall receive the gift of the Holy Spirit. That is the way to become a Christian. The only way. Reread this message—examine the scriptures yourself—find out if what I tell you is truth. If you have questions, write to me, or call me. I will gladly answer all of your questions. But, then I will have two questions for you.